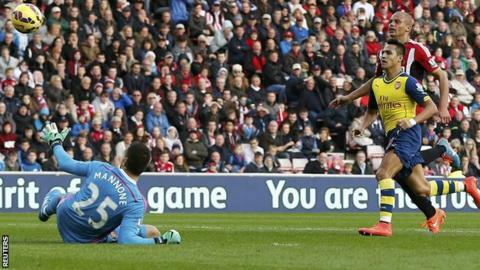 Sunderland were unable to exorcise their embarrassment at Southampton as Arsenal won at the Stadium of Light. Alexis Sanchez capitalised on Wes Brown's dreadful passback to clip Arsenal ahead after half an hour. And, despite performing with more resolve than in their 8-0 defeat at St Mary's last Saturday, Sunderland lost another bad goal in stoppage time. Goalkeeper Vito Mannone dawdled with the ball at his feet, allowing Sanchez to steal in and secure the win. The late goal ensured that Arsenal would win this fixture for the fourth consecutive season but Arsene Wenger's side were far from convincing. The visitors, who had to win to avoid recording their lowest points total after nine games in the Wenger era, offered a performance as uninspiring as the one that earned them a late win over Anderlecht in the Champions League on Wednesday. Chances were scarce, with the goals the consequence of two grotesque Sunderland mistakes. Brown and Mannone both retained their places, along with the rest of the back four who capitulated last Saturday, but neither could take the opportunity to redeem themselves. Centre-back Brown was spared some of the criticism this week, given that the score was just 3-0 when he was withdrawn at Southampton, but it was his horrible error that gifted Arsenal the opening goal. Sunderland's only win in their last 22 league games against Arsenal was in November 2009. Darren Bent scored in a 1-0 win at the Stadium of Light. The former England defender brought down a long ball at the edge of the centre circle and, under pressure from Sanchez, tried to shunt it back towards Mannone. However, Brown instead scraped his studs across the top of the ball, allowing the Chilean to scamper towards goal before clipping over the exposed goalkeeper. Mannone, though, was completely culpable when Sanchez scored his second. Santiago Vergini shunted a loose ball towards the Italian, who took a decent touch before getting his feet into a frightful tangle. The ball spurted away from him and former Barcelona forward Sanchez pounced. Without those mistakes, Arsenal struggled to create openings; Danny Welbeck lashed over, Santi Cazorla fizzed an effort just wide and Mannone thwarted Calum Chambers from a narrow angle. Instead, Sunderland grew gradually more emboldened and, as the second half progressed, enjoyed the better opportunities. Wojciech Szczesny had to plunge to his left to grasp a Jack Rodwell header and then had to pluck a Sebastian Larsson shot from the air. But, for all their huffing and puffing, Sunderland were unable to prevent a difficult week ending with the loss of their unbeaten home record. Sunderland manager Gus Poyet: "I wanted to see the players be brave and pass the ball and I think they were close. "We didn't make many mistakes in the first seven games but in the last two games we made more than you expect in the whole season. We need to put that right. "There is no other way other than to keep working, convincing the players and trying not to make mistakes and hopefully try to win a game." Arsenal manager Arsene Wenger: "We had a lot of the ball and Sunderland were focused on defending. They came out with more purpose in the second half but on the break we had many chances. "In life you can always improve but what was important for us today was to get the three points and keep a clean sheet." Match ends, Sunderland 0, Arsenal 2. Second Half ends, Sunderland 0, Arsenal 2. Goal! Sunderland 0, Arsenal 2. Alexis Sánchez (Arsenal) right footed shot from the right side of the six yard box to the bottom right corner. Attempt missed. Santiago Cazorla (Arsenal) left footed shot from the centre of the box is too high. Assisted by Danny Welbeck. Substitution, Arsenal. Tomas Rosicky replaces Alex Oxlade-Chamberlain. Attempt blocked. Aaron Ramsey (Arsenal) right footed shot from outside the box is blocked. Assisted by Alexis Sánchez. Attempt blocked. Alexis Sánchez (Arsenal) right footed shot from the left side of the box is blocked. Assisted by Aaron Ramsey. Attempt missed. Santiago Cazorla (Arsenal) right footed shot from outside the box is high and wide to the right. Assisted by Danny Welbeck. Attempt missed. Lee Cattermole (Sunderland) right footed shot from outside the box is close, but misses to the left. Assisted by Patrick van Aanholt with a headed pass. Attempt saved. Santiago Cazorla (Arsenal) left footed shot from the left side of the box is saved in the bottom right corner. Assisted by Danny Welbeck. Attempt missed. Patrick van Aanholt (Sunderland) right footed shot from the centre of the box misses to the right. Assisted by Wes Brown. Foul by Jordi Gómez (Sunderland). Attempt missed. Patrick van Aanholt (Sunderland) left footed shot from long range on the left misses to the right. Attempt missed. Danny Welbeck (Arsenal) header from the left side of the six yard box is just a bit too high. Assisted by Nacho Monreal with a cross. Offside, Sunderland. Patrick van Aanholt tries a through ball, but William Buckley is caught offside. Attempt missed. Jozy Altidore (Sunderland) right footed shot from the right side of the box misses to the left. Assisted by Jordi Gómez. Attempt saved. Jozy Altidore (Sunderland) header from the centre of the box is saved in the top left corner. Assisted by Patrick van Aanholt with a cross. Substitution, Sunderland. Jozy Altidore replaces Adam Johnson. Substitution, Sunderland. Jordi Gómez replaces Jack Rodwell. Substitution, Arsenal. Héctor Bellerín replaces Kieran Gibbs because of an injury. Mikel Arteta (Arsenal) wins a free kick in the attacking half. Foul by Jack Rodwell (Sunderland). Connor Wickham (Sunderland) is shown the yellow card for a bad foul. Calum Chambers (Arsenal) wins a free kick on the right wing. Jack Rodwell (Sunderland) wins a free kick in the defensive half. Calum Chambers (Arsenal) wins a free kick in the defensive half. Attempt saved. Sebastian Larsson (Sunderland) right footed shot from outside the box is saved in the top right corner. Assisted by Lee Cattermole. Lee Cattermole (Sunderland) is shown the yellow card for a bad foul. Hand ball by Adam Johnson (Sunderland). Attempt saved. Alexis Sánchez (Arsenal) right footed shot from outside the box is saved in the centre of the goal.